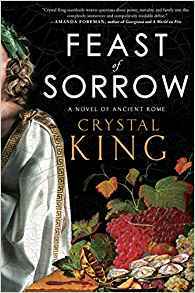 On a blistering day in the twenty-sixth year of Augustus Caesar’s reign, a young (slave) chef, Thrasius, is acquired for the exorbitant price of twenty thousand denarii. His purchaser is the infamous gourmet Marcus Gavius Apicius, wealthy beyond measure, obsessed with a taste for fine meals from exotic places, and a singular ambition: to serve as culinary advisor to Caesar, an honor that will cement his legacy as Rome's leading epicure. Apicius rightfully believes that Thrasius is the key to his culinary success, and with Thrasius’s help he soon becomes known for his lavish parties and fantastic meals. Thrasius finds a family in Apicius’s household, his daughter Apicata, his wife Aelia, and her handmaiden, Passia, with whom Thrasius quickly falls in love. But as Apicius draws closer to his ultimate goal, his reckless disregard for any who might get in his way takes a dangerous turn that threatens his young family and places his entire household at the mercy of the most powerful forces in Rome." 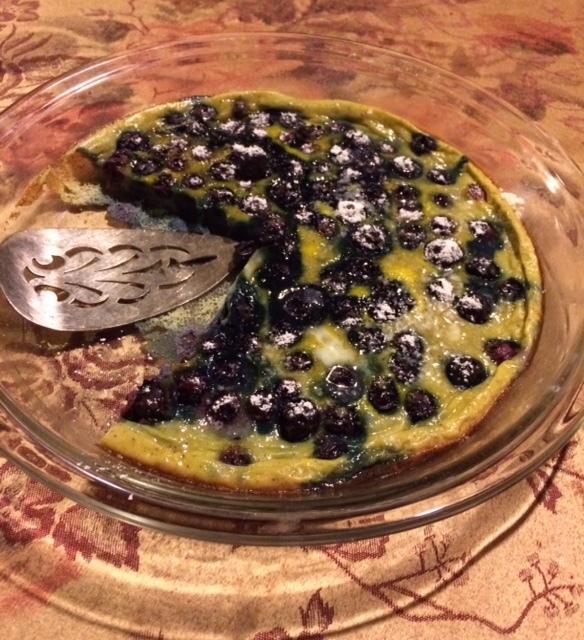 Our challenge at Cook the Books is to create a dish inspired by whatever book we are reading. The only problem with this one, given its countless food mentions, was to narrow things down. To go along with the novel and to help with the cooking, I purchased a copy of Cooking Apicius, by Sally Grainger, which is quite interesting and informative regarding ingredients, and the preparation of ancient Roman food. So we have garum for salt and date, or defrutum or other wine syrups to replace sugar. Can you imagine Italian cooking without tomatoes, pasta and most of the cheeses of today? Really! 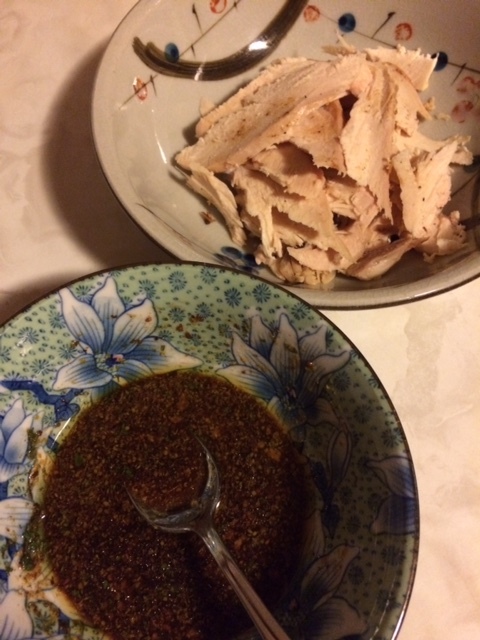 I was encouraged by Grainger's book to give fish sauce (garum) more of a go, as I'd been relegating it to green papaya salad and a few other Thai dishes. For more on that subject see a post from my past on fish sauce. Just did a taste testing of the ancient brew mentioned in that post and of a more recently purchased (unnecessarily as it turns out) Thai Kitchen brand. Couldn't tell the difference, both fairly salty, not fishy, but umami. So it stands to reason why salt is not needed in their recipes. Another article you may be interested in from The Guardian, discusses garum's continued use in present day Italy. 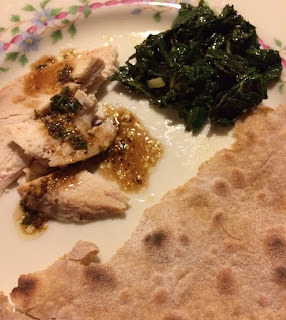 The dishes I decided on were all in Cooking Apicius: slices of roast chicken served with a Roman style sweet sour sauce (an excellent use of left-over chicken), cabbage with cumin, leek and coriander, and flatbread (lagana). This handy video helped with correct forming of the bread. 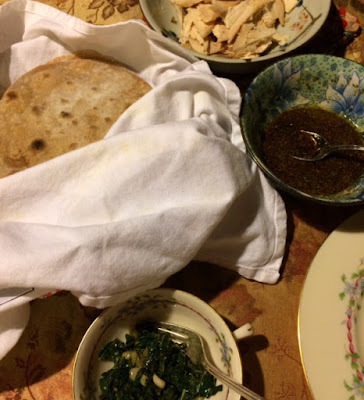 Altogether a type of everyday Roman meal. Dry roast the dill (and the asafoetida if used) in a frying pan and grind to a fine powder. Chop the mint and combine with the spice in a bowl and add the other ingredients. Mix well and allow to stand to combine the flavours. Taste. If it is too sweet add a little more fish sauce, too vinegary, a little defrutum. Serve with cooked chicken pieces. I plan on using the extra sauce as a salad dressing. 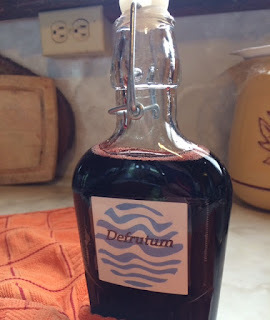 This is a simple syrup made from grape juice with either figs or quinces added to the syrup while cooking. Bring the grape juice to a gentle simmer and cook on the lowest setting for at least 2-3 hours. Check constantly to ensure it does not reduce too much and take it off the heat when the volume has reduced by two-thirds. Cool and remove the figs. Store in a corked or close-fitting bottle. Don't you love my cute label? The figs are very good for dessert, sliced and served with ice cream or creme fraiche. Prepare the cabbage by cutting off the thicker stalks and trimming any discolored leaves. Coarsely shred it and wash in cold water. Put the olive oil in a large, deep lidded pan and heat. Drain the cabbage into a colander and shake off most of the water. Place in the hot pan. Cover it and leave for a few minutes to heat and then stir briskly. Cover again and steam the leaves briefly until just cooked. Keep some crispness to the leaves and remove the lid so that any remaining water can evaporate. Add the ground cumin and a splash or two of the wine. Heat through over a hot flame and flavor with a little fish sauce or with salt. Serve with the hot steamed leek (I just steamed the onion with the cabbage in the last covered bit) and chopped coriander sprinkled over the top. Finish with freshly ground pepper. Sieve the two flours together and discard any large flakes of chaff. Add the water and begin to knead the dough with your hands until it forms a single ball. 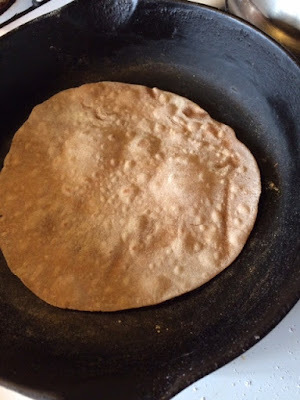 Flour has different absorbency rates and so more or less water may be necessary. Continue to knead for 5-10 minutes until smooth and pliable. Put in a bowl and cover the dough with cling-film or a damp towel. Leave to rest for one hour. Bring it out onto a floured surface and divide in half. Return one half to the covered bowl and roll the other into a sausage. Divide this into ten parts. Put all the pieces back in the bowl, dust with flour, cover with cling film so it doesn't dry out. Prepare the area for rolling in advance. Dust the surface with flour and have a pile of flour to one side. Heat a griddle or heavy frying pan (I used a cast iron one) over a medium flame or setting. Watch the video clip above for rolling instructions. When you have a few discs ready you can begin cooking. Place each one on the hot dry frying pan and leave for roughly 20-30 seconds, at which point the bottom should have brown patches. Turn and cook a further 10-12 seconds and remove with tongs. If you are serving them as bread, pile them up in a basket lined with a napkin. Leave them covered until ready for service. Alternatively, re-heat in an oven wrapped in tin foil. For dessert I made what was called in those days a patina, which is basically a simple egg custard with various things added, such as fruit or nuts. 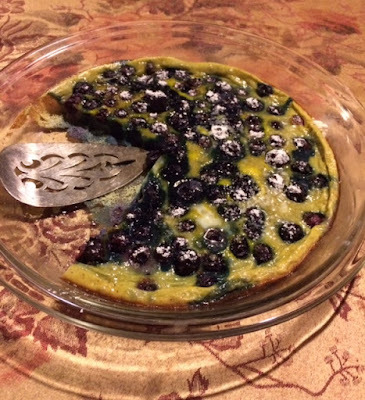 Mine was a blueberry patina, as we had blueberries that needed to be used. It was sweetened with some of the Defrutum, as well as unauthentic powdered sugar on top. We both enjoyed our Roman dinner experience. I did not mention to Bob that there was fish sauce in several of the dishes. :) Why mess with someone's head? being my thought. This will be posted at the Roundup for the current Cook the Books selection, after the 31st, at Beth Fish Reads for her Weekend Cooking event, Jan. 13-14, as well as with the January Foodies Read Challenge. Hope you will visit and check out the ancient as well as current foods on offer, not to mention good book recommendations. Wow amazingly ambitious and everything looks good! I just got this book from the library, I hope I get around to reading it before I have to return it. I very much enjoyed this book, great writing. Sharing with Twitter! Thanks for the interesting history and tempting dishes, and especially for the link to the Guardian article. I'll have to check and see if the local Zingerman's has that sauce. Ha! Why mess with someone's head, indeed. Claudia, you're feast is amazing and if we had a prize for the most researched and authentic post, you would win this round! Very interesting and informative post (and delicious looking as well). Love the tip for leftover chicken. I think I'd like all of those, especially the cabbage. I've never heard of Defrutum before. Wow....I loved the novel and now your post makes me want to get the cookbook. What a great feast you created. I like that you took the trouble to make authentic Roman dishes. Thrasius was my favorite character in the book. You?